In Are You Playing Games with Metadata, Jim Harris discusses the importance of metadata management as a subset of data management. “Among its other possible uses, metadata often plays an integral role in determining your data usage, gathering your data requirements and defining your naming conventions,” he writes. I would agree with Jim’s definition of metadata as any “label that provides a definition, description or context for data”. However, his examples – which range from logical data models, to attribute naming conventions, highlight my issue that metadata is, in fact, an overarching term for a wide variety of artifacts. In Metadata Meatballs, Henrik Liliendahl Sørensen, discusses how this diversity can create confusion. “Despite best intentions there will probably always be someone, somewhere getting something different from your wordings,” he observes. For me there are two key issues with the use of the term metadata, as described in the post What is Metadata Anyway? 1.) The term is too broad to be used for practical management. A so-called metadata tool must capture and document a wide range of asset types, ranging from Attribute Naming Conventions, to Business Data Glossaries, to Logical and Conceptual Data Models, Data Dictionaries, Lineage, Data Quality Rules and Standards, Attribute Definitions, ETL processes and rules, and many more. Very simply put, metadata management requires the management of a host of smaller, more clearly defined assets and will require the use of a variety of tools, many of which may already exist in an organisation. 2.) The term is not business user friendly. In particular, because the definition keeps changing depending on the context (are we looking at data quality rules today, or is it data governance policies? Or maybe we want to build a logical data model. In each case, metadata means something very different. Henrik likes to use analogies with food. I have done this myself in the past, most recently with the Data Quality Cookbook. The problem with this question, just like the question “How do we best manage metadata?” is that the question is incomplete. Could the answer be the Le Cuisine Francois – the bible of modern French cuisine? 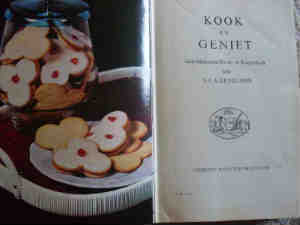 Or what about the South African classic Kook en Geniet? Maybe your fancies lean to Asian flavours, or modern vegetarian, or baking? Like cooking, metadata management covers a broad range of topics, and best practice, and the best tools for particular metadata, can vary depending on the metadata type, on your role, and on your requirement. Some of these assets may be defined in technical terms (and technical tools) for use by your IT team (to build databases, data integration and the like). Others may be described in business terms for use by your data stewards and business stakeholders. Others may require both levels of definition, or require mappings between business and technical definitions of terms. A data governance platform plays a critical metadata management role. Your data governance platform should support the business definitions of various metadata assets, and allow these to be linked to technical metadata that may be generated by technically oriented tools, such as your data modelling tools or your ETL tool. A data governance platform will support collaboration between your data stakeholders to ensure that terms are accurately defined, approved by the responsible stakeholder and published for use across the organisation. This ensures that current, correct metadata can be easily accessed and used to support all data management functions in a consistent way.